Emirates Holidays is passionate about creating your perfect vacation, featuring destinations around the world. From white sandy beaches to romantic retreats, it's never too late for a last-minute getaway complete with flights on award-winning Emirates. Start planningStart planning your next vacation Opens an external website in a new tab. Earn additional Skywards Miles, beyond the Miles earned on your Emirates flight, when you book with Emirates Holidays. You can also redeem Miles against your Emirates Holidays package in the UAE, the UK, and the Republic of Ireland. Global except the United Kingdom and the Republic of Ireland: Earn 20% bonus Miles when you book a minimum three-night Emirates Holidays package. The United Kingdom and the Republic of Ireland: Earn 1 Skywards Mile for every GBP 3 or EUR 3 spent on your minimum three-night Emirates Holidays package, in addition to the Miles earned on your Emirates flight. In the UAE, the UK, and the Republic of Ireland, you can put your Skywards Miles towards Emirates Holidays packages. For every 5,000 Miles you redeem, you’ll get AED 110* off your package. There’s no limit to the number of Miles you can redeem. You can choose to pay using just Miles or a combination of cash and Miles. UAE: Visit an Emirates Holidays retail store or call 800 4969. UK: Contact our Travel Consultants at 020897289500. Republic of Ireland: Contact our Travel Consultants on 1800800741. Remember to give your Emirates Skywards membership number when you book. *GBP and EUR equivalent in the UK and the Republic of Ireland based on our exchange rates. Once services are booked, no refund will be given for the cash value of Miles redeemed. Miles do not accrue on redemption packages. Minimum redemption levels start at 5,000 Miles. You can redeem Skywards Miles with Emirates Holidays to book a vacation for yourself or for someone else. Skywards Miles may be redeemed by a parent or guardian on behalf of a Skysurfer under 18 years of age. Skywards Miles can be deducted from only one membership account per transaction; it is not possible to pay with Skywards Miles from multiple accounts, even if the member is present. Emirates Holidays packages paid in full or in part with Skywards Miles will not be eligible for the 20% bonus Miles that usually apply on Emirates Holidays packages. Miles will, however, be accrued on the Emirates flight portion of the booking, if applicable. All rewards must be booked via an Emirates Holidays retail outlet or the Emirates Holidays call center (800 4969) in the UAE. You must give your membership number and supply a copy of your passport to verify your membership details. 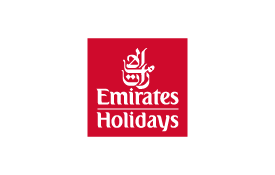 Emirates Holidays may at any time without notice alter the number of Skywards Miles required to earn a redemption discount and withdraw or impose additional restrictions on the use of Skywards Miles. In the event an Emirates Holidays booking paid for in full or in part with Skywards Miles is canceled, the Miles will not be refunded. Instead, a Miscellaneous Charges Order (MCO) will be issued for use on a future Emirates Holidays package. All other standard cancelation policies will apply. When paying with Skywards Miles, you acknowledge that Emirates Holidays will have access to the number of Skywards Miles available in your account. Skywards Miles will be redeemed from your account instantly. Once redeemed, Skywards Miles are nonrefundable. You can book Emirates Holidays packages using Skywards Miles or a combination of cash and Skywards Miles. Emirates Skywards program terms and conditions apply. Specific redemption terms and conditions apply in the UK. Please click here for full details. All rewards must be booked via our UK call center (+44 208 972 8950). Specific redemption terms and conditions apply in the Republic of Ireland. Read the full details. All rewards must be booked via our travel consultants in the Republic of Ireland (+44 180 080 0741).